Almond chicken stew – Succulent chunks of chicken breast stewed in a creamy almond butter sauce with a medley of spices creating irresistible flavour. Are you a huge fan of nut butter? What about chicken? 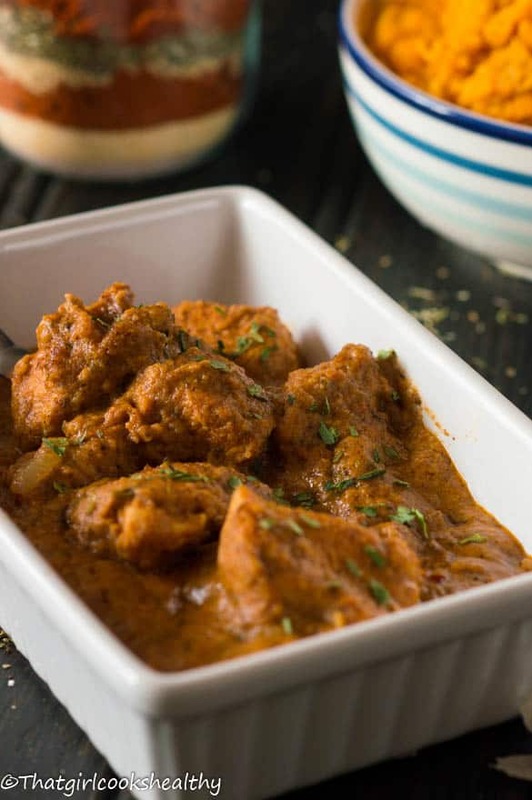 Then you are in the right place, so grab a plate or two and gather around the table because this paleo style almond chicken stew recipe has your name written all over it. 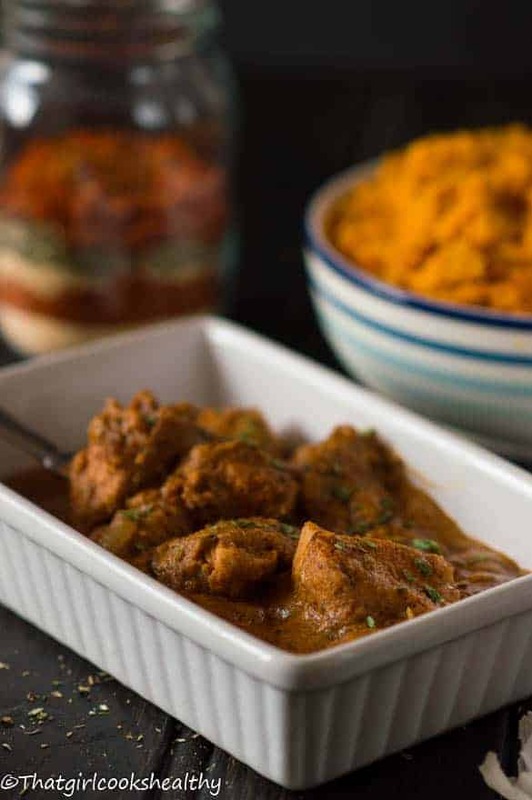 The almond chicken stew is actually inspired my the West African peanut stew, if you haven’t tried African peanut stew or even the soup I highly recommend it. I just couldn’t pass up the opportunity to make my own rendition of this wonderful meal. 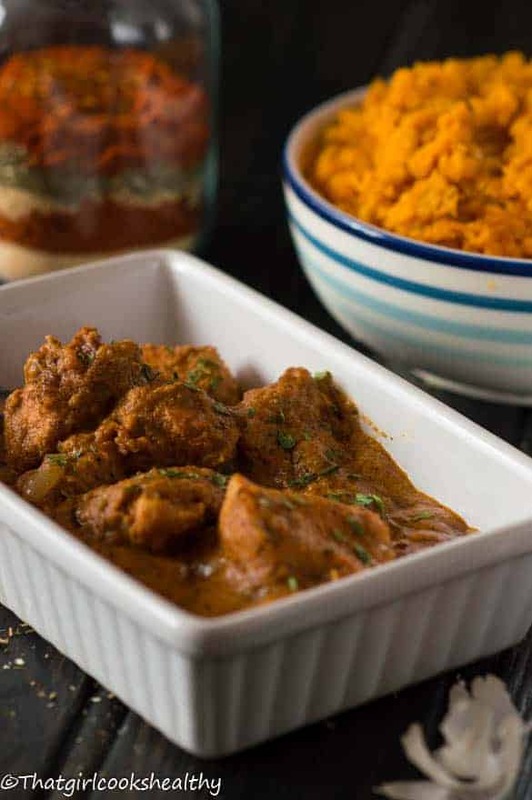 I have come across different variations of the aforementioned dish some vegan and some carnivore nevertheless the end result is a rich, creamy moderately seasoned stew. With my recipe you can go even further and recreate the darn thing by making it vegan, toss in some pulse or beans and omit the meat if you wish. I haven’t tried this myself, but I’m sure if will taste just a fab. Do note that this recipe is legume free (peanut is a legume) and also not a part of the paleo diet. However, if you’re gluten free then this recipe shouldn’t be a problem as I paired the chicken with some sweet potato mash. The meat is generously seasoned with my creole cajun seasoning mix, so make sure to have some stocked up in the spice rack because you’ll be needing it on rotation. You can prep the dry rub overnight to allow it to infuse the chicken for several hours, that’s my preferred way of doing things. Following on from seasoning the meat, you should brown the meat before adding and/or prepping the additional ingredients. The almond butter should be smooth not the crunchy kind unless of course you want to use that one and the nut butter is added towards the latter stage of cooking. If the stew seems too thick then simply add more water, be careful not to add too much. Season the chicken overnight with the cajun seasoning mix and refrigerate. Bring the sweet potato chunks to the boil in a large pot until tender. Allow to cool before mashing each one with a potato masher and set aside ready to serve with the chicken. Heat some coconut oil in a sturdy non stick pan (2tbsp should suffice) and begin to sautee the onions and garlic until transparent on medium heat. Quickly add the chicken chunks and brown the meat. As the meat starts to darken, season further with the thyme, parsley ginger and any optional seasoning you may require. Flip and coat every piece of chicken with the seasoning. Pour in the tomato puree and combine with the meat. Add the creamy almond butter with 1 cup of warm weather, use warm water to keep the temperature levels in sync. Give the entire contents another stir below covering with the lid. Let the chicken simmer for 10 minutes, check the consistency of the stew, if too thick add a small amount of water to your preference. Once cooked serve with the sweet potato mash. Oh WOW ! 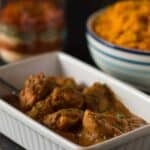 I REALLY REALLY like Love your twist on this African favorite chicken stew Charlene. This is a winner in my books- Looks Absolutely scrumptious!! Must try for me. Ha, when I first saw the name of the recipe I thought oooh that reminds me of our ‘granat stew@ peanut butter stew. It looks so lush. Yes, it does bear a slight resemblance and thanks for the compliment. Wow this looks so good. I’ve never thought of adding Cajun spice and almond butter with chicken to braise. I need to try this. wow I cannot wait to try this! Love the use of almond butter and chicken. Another fan of almond butter, awesome and gimmie a high 5 lol. I’ve been reading about African cooking lately … was a bit intimidated, because it’s so very different from Ohio styles (!) this recipe makes me confident I can try it. Yes, cooking other person’s cuisine can be intimidating that’s why I tried to make it as simple and novice friendly as possible. OOh.. This looks good. I’ll have to look out for the African Stew and give it a try. I love “inspired by” dishes shows we don’t have to stick to the same thing forever. 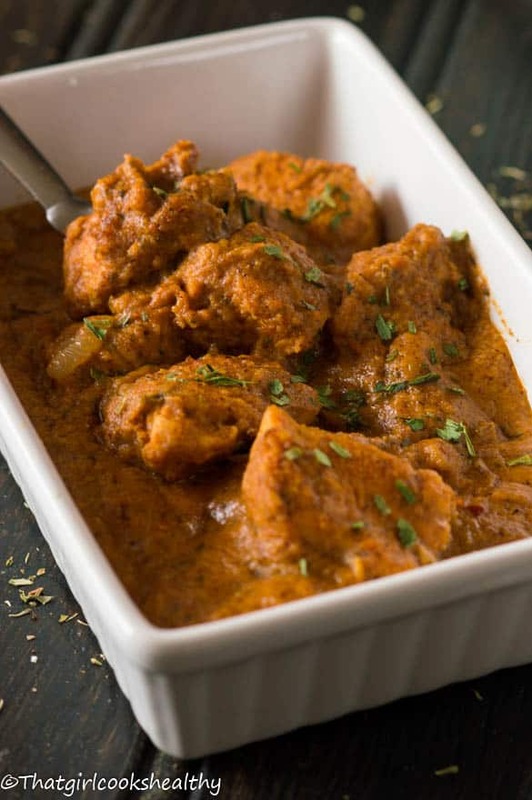 I think you will like this recipe, it’s very flavourful. HAHA No, you’re not weird at all. This recipe would go well with some flatbread. I’m so glad you liked it Whitney, I agree the leftovers are yummy!